Scientists at the University of Arizona (UA) are now researching a new method for treating wet Age-Related Macular Degeneration (AMD). Thanks to a new grant, researchers have the ability to test out their new formula on local AMD sufferers. Professor Brian S. McKay, who teaches ophthalmology and vision science at the university, is the head researcher on this project. The National Eye Institute of the National Institutes of Health recently donated $1.7 million to help Dr. McKay study the effects of L-dopa eye injections. L-dopa, also called levodopa, is an amino acid that has been used extensively in the treatment of Parkinson's patients. Dr. McKay believes an L-dopa injection into the eye could get rid of the need for AMD patients to receive regular eye injections. One patient who's testing out this L-dopa procedure is Howard B. Morrow Junior. Morrow, 85, has suffered from the wet form of AMD for a few years now. He is hopeful the L-dopa injection will get rid of the need for ongoing injections into the eye. Morrow says anyone who's going in for their first AMD injection shouldn't worry all that much. Although it's scary to see the needle go into your eye, you can't feel a thing. 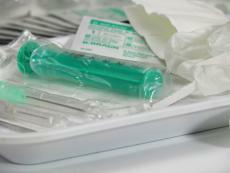 The needles used nowadays in wet AMD treatment are all hypodermic. Professor McKay is optimistic his L-dopa treatment will greatly enhance wet AMD patients' quality of life. He told reporters "I came [to UA] saying I was going to cure AMD, and I'm doing what I said." Recent estimates show that 30 percent of adults around the world will get AMD as they grow older. As the global population ages, eye doctors believe the amount of people with AMD will skyrocket in the coming years. There are two main forms of AMD: wet and dry. The retinae in dry AMD patients' eyes deteriorate over time. On the other hand, damage to wet AMD patients' retinae is caused by blood that leaks out of nearby vessels. About 90 percent of patients with AMD have the dry form. Wet AMD is far more serious and generally requires weekly injections of drugs like Lucentis, Eylea, or Avastin. A few other treatment options include dietary supplements, laser surgery, and blood vessel growth inhibitors. Around 200,000 Americans are diagnosed with AMD every year. Most people with AMD are over the age of 60. Eye doctors recommend getting a routine eye exam at least once per year, especially if you're over 40. The symptoms of AMD often don't appear until the disease has progressed a great deal. Doctors can do more to slow down the progression of AMD the sooner they discover it.